In 1896, William Henry Schmidt was told by his Rhode Island doctor that he had six months to live. Stricken with tuberculosis, his only hope was to move to a drier climate. The doc said that he’d heard Southern California was a good place for cases like this, but these were apparently rumors and nothing else. With six of his siblings already dead from the disease, Schmidt decided to try his luck. In the late 1890s, he arrived in Bakersfield and landed a job with the Kern County Land Company. 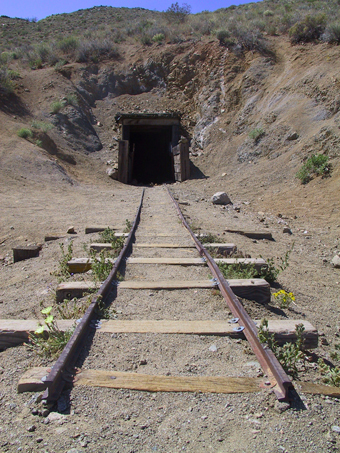 Through his work, he found that gold had been discovered in the El Paso mountains, near Garlock (now an abandoned mining town). The route into the backcountry was a dry wash that could only be navigated on foot or by burro. Purchasing two animals, which he named Jack and Jenny, he began prospecting and soon filed a few claims. When a valuable vein of ore is discovered, there are still thousands of pounds of rock must be moved to a plant for processing. Schmidt abhorred the idea that he would have to haul his ore down the treacherous dry washes, and figured that if he could dig a small tunnel through the hill near his home, and meet up with the Borax road, he could save himself the drudgery. With only his burros as company, Schmidt set to his task in 1906. During the hottest summer months, he worked as a ranch hand along the Kern River to buy supplies for his mining operations. The rest of year, he worked on lengthening his tunnel into the granite mountain. He built a one-room wooden shack and outfitted it with a wood- burning stove which he had found and laboriously carried back during his travels through the backcountry. When the digging started, Schmidt hauled the broken boulders out on his back, but soon began to lay a narrow-gauge track for a mining car, hauled along the tunnel by Jack or Jenny. He worked by the light of a two-cent candle until he could afford a kerosene lamp. Beginning with only picks and chisels, he eventually brought in dynamite to make the work go more quickly. Schmidt was so poor that he often couldn’t afford much fuse, so he began cutting them into shorter pieces, leaving him little time to run for cover. He often showed up at other miner’s shacks asking to be taken to the hospital after a particularly nasty run in with his short fuses. By 1915, he realized that the tunnel project was never going to help his mining operations, but by now he was obsessed. At about 1,200 yards he made a 90-degree left turn to the north and then another one to the right. For some reason, he decided to go back to the first turn and go in the opposite direction—due south. In 1938, he broke into the sunlight 2,000 feet above the valley floor…and decided to stop. He had dug half a mile through solid granite. Amazingly, a careful examination while touring the tunnel reveals occasional traces of gold, but apparently Schmidt was too consumed with where he was going to take any time out for mining the veins. Ripley’s Believe It Or Not ran a feature on Schmidt, calling him the “Human Mole,” and visitors began to trickle out into the high desert to have a look at his achievement. He charged a small fee to give tours and lived a reasonably comfortable retirement, surviving over 50 years beyond the Rhode Island doctor’s prediction. He is buried in the cemetery of the nearby town of Randsburg. 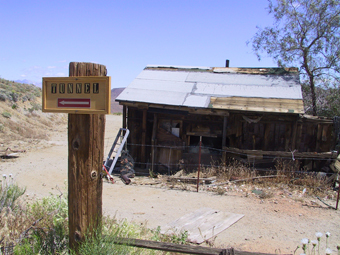 In the early 1960s, Tonie Seeger leased the land from the government as an escape from the urban life of Orange County. She and her husband built a small home next to Schmidt’s old shack and continued to accept donations from visitors. Her hubby died two years later, and Tonie carried on the tradition until 2003, when she died quietly in the place she had built with her husband. In 1999, I visited the site with my buddy Scott Lindgren, a professional photographer. We knocked at the door and followed Tonie into her living room, winding our way through stacks of old magazines and newspapers. She launched into her speech about the Schmidt and the tunnel, then invited us out to the old shack to continue the tour. The clapboard hovel was plastered from floor to ceiling with old magazines from the 1910s through the 1940s. Covers of Life, Look, and assorted movie magazines provided a kind of wacky history lesson. Most of Schmidt’s pots, pans, and assorted mining jetsam appeared to be left where they were when he died. Seeger finished her spiel and then, for some reason she then launched into a rant about Richard Nixon and what a terrible person she thought he had been: “I wouldn’t trust that man as far as I could throw him, and that wasn’t very far.” This turned out to be more fun than the packaged tour, and Scott left a video camera running while she rambled on. The home and shack are now administered by the Bureau of Land Management, and is surrounded by barbed wire (there is a large gap in part of the fence) and is apparently off-limits to backcountry visitors. Be sure to bring a couple of flashlights for the tunnel. A hard hat also helps if you are much over five feet tall. The tunnel begins a little further uphill around a bend in the road. After just a few minutes of walking, the entrance is only a speck of light that seems to hang in a space of infinite blackness. Depending on how fast you can walk, and self-interpretive stops, it takes about half an hour to make your way out the other side. A nice afternoon can be spent in the tunnel, and a picnic in the inky dark would be a plus.